Description of "PSYCHO LOGICAL FRONTIER SCIENCE"
"Albert Einstein use only 11% of his brain, it's nothing but observation." Today every person in the world knows and understands the tremendous progress that science has done and still is doing for our life. This book is about my observations in "FRONTIER SCIENCE” and complicated facts, as science does not provide answers to most of the questions, this seems to be like science is limited. This book is also about when science is beyond the limit, and then it provides confusion, problems, or maybe threat to the world. One hand, this is kind of frustrating, on other hand this is a kind of "FRONTIER SCIENCE” making it very exciting. It shows us that no matter how much we feel we are on the top of things, on a tiny fragile island (EARTH) in space looking into the sky wondering how our universe works. There is so much left to learn and that is awesome. I’m not a scientist, and this book is not based on the scientism theories. I'm 18 years old Bachelors Student in Science. I just want to say, how ordinary people like me think about this psycho universe, apart from science in a logical way like science fiction, which is beyond our limits of imagination, so that every kids can understand easily. As every new theories in science was started from observation and imagination. 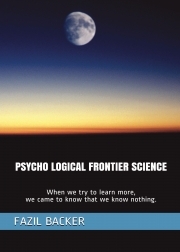 Reviews of "PSYCHO LOGICAL FRONTIER SCIENCE"